In large bowl, combine 1 cup margarine and sugar; beat until light and fluffy. Add vanilla, chocolate and egg; blend well. Lightly spoon flour into measuring cup; level off. Gradually add flour, mixing well. Cover with plastic wrap; refrigerate 30 minutes for easier handling. Heat oven to 375°F. Shape dough into 1-inch balls; place 2 inches apart on ungreased cookie sheets. With thumb or handle of wooden spoon, make indentation in center of each cookie. Bake at 375°F. for 8 to 10 minutes or until set and firm to the touch. Cool 1 minute; remove from cookie sheets. To make turtle filling, in small saucepan, combine caramels and half-and-half; cook over low heat until melted and smooth, stirring constantly. Fill half of cookies with 1 teaspoon filling each. Top each with pecan half. 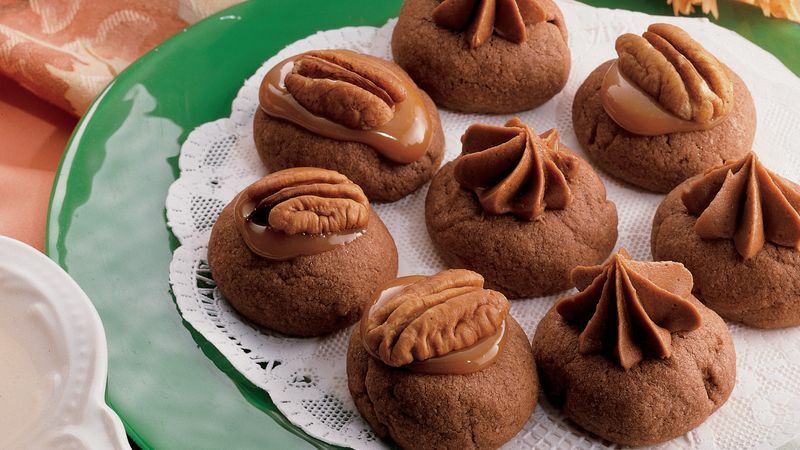 To make mocha brandy filling, in small bowl, combine 1/2 cup margarine and cocoa; beat until light and fluffy. In another small bowl, dissolve instant coffee in water; add brandy. Add coffee mixture to margarine mixture; blend well. Add powdered sugar; beat until smooth. Fill remaining half of cookies with 1 heaping teaspoon filling each.